Class of 2016 Basketball Hall of Famers are one of the most decorated inductees when big names like Allen Iverson, Shaquille O'Neal, Yao Ming and Sheryl Swoopes were enshrined here on Friday. Most of fans wore Iverson's No. 3 jersey with the Philadelphia 76ers for the Enshrinement Ceremony at the Symphony Hall of Springfield, which also proves Iverson's jersey is one of the best-selling jersey in NBA's history. Iverson's popularity showed up when fans gave a 3-minute standing ovation before he stepped up the stage for his speech. The superstar almost began to cry from the very beginning before he read a long list of people's names he wanted to thank for. Yao Ming, the first Asian player that is ever been elected into the Hall of Fame, was the first to give his words. He also gave his tributes to Iverson, saying, "I think the (No.1 spot) belongs to Allen Iverson" before he adding "because I need more practice than him". O'Neal, one of the best centers in NBA history, almost brought his whole family for this gala to celebrate his big day as a basketball player, though he has had enormous achievement in his decorated career. 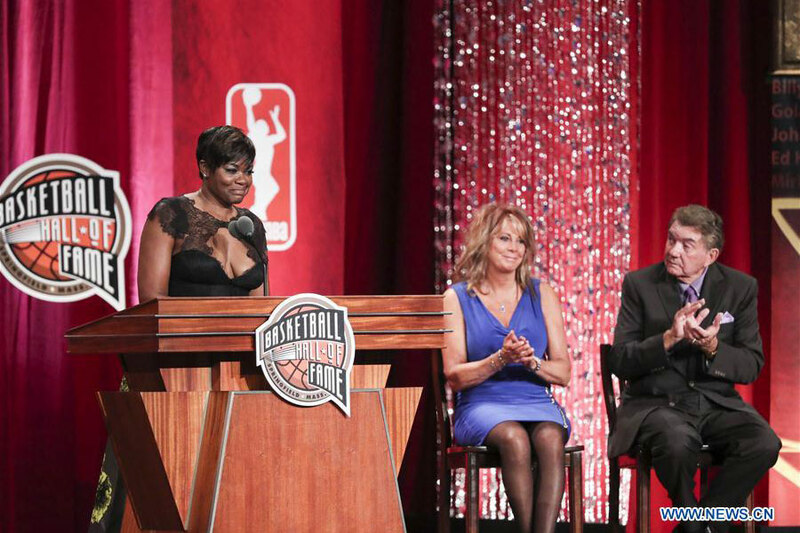 Swoopes, one the most successful women's basketball players in US history, became the Hall of Famer one year after her long-time national teammate Lisa Leslie was introduced on the same stage in 2015. All these players were widely considered as future Hall of Famers right after their retirement from the games, and the ceremony was just another acknowledgement for their accomplishments in their careers. The Class of 2016 also includes NBA referee Darell Garretson, ABA superstar Zelmo Beaty, Michigan University coach Tom Izzo, coach John McLendon, football Hall of Famer Cumberland Posey and Chicago Bulls owner Jerry Reinsdorf. All the 10 inductees were given new orange Hall of Fame jacket on Thursday and will receive their Hall of Fame rings on Saturday.